I think it's time for a coffee break. I rush around, juggling my workload until I can finally manage to fit in 15 minutes for a quick mug-full of that sacred, sacred Joe. But if I were a plant like Cocoa, Kola, Guarana, or Coffee, I wouldn't have had to make the time - I would already have the caffeine built in. Do these plants realize just how lucky they are? That is, of course, assuming that plants use their caffeine to get a buzz on. 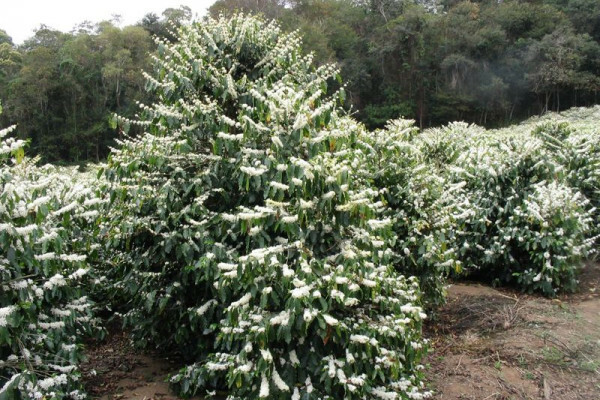 In truth, scientists have only begun to guess why some plants produce caffeine. Caffeine is classified as a secondary compound which means it is not essential for the plant's survival. In fact there are many species of caffeinated plants with decaffeinated relatives (poor things), but, as a non-essential component, it can be harder to pinpoint exactly what the caffeine is doing there. Chemically, caffeine is a methylxanthine. Many methylxanthines are used as pesticides both by humans and plants. It's possible, though not confirmed, that caffeine is used to poison herbivores and plant pests to discourage them from attacking that plant type again; that is, if they survive after metabolising the caffeine. But because caffeine is toxic to plant cells it's stored in specialised cell compartments called vacuoles which are rather like a medicine chest and keep the caffeine safely locked away from the rest of the cell contents until it's needed. Unfortunately this means that the plant doesn't get to enjoy the buzz from its own caffeine (assuming plants can experience a 'buzz'), but that's a necessary trade-off of having a toxic substance lying around. So it seems that caffeinated plants are lucky to have this compound as part of their natural defences, but it doesn't deter all attackers. For instance, caffeine doesn't poison humans in the doses that we typically ingest (even a Monday morning dose), but it does cause addiction. It works by stopping the enzyme phosphodiesterase from breaking down a signalling substance called cyclic AMP (cAMP for short) and its close relatives. One of the actions of the stress hormone adrenaline is to increase the levels of cAMP in cells, so by preventing cells from breaking down cAMP, caffeine potentiates the action of adrenaline, and gives us a buzz. In even higher doses, and with prolonged use, it can trigger anxiety, muscle tremors, palpitations and fast heart rates, and profound withdrawal effects including headaches, inability to think clearly, and bad moods whenever you mistakenly switch to decaff ! Caffeine-containing plants may be safe from certain insects, vertebrates, bacteria and fungi, but they are preyed on by humans who love the rush it gives them. Not so lucky then, I guess? But there is a hypothesis that plants synthesise psychoactive compounds to target and manipulate humans in particular. In other words, if humans desire the plants, then they will cultivate them. The plants may get processed and eaten up by humans, but because they have been better cared for, they will be able to produce more offspring first. If this hypothesis is true, I think caffeine-producing plants should win whatever the highest international award is for human psychology. Thank you. A few weeks ago I wondered about this exact subject. What is the benefit of caffeine to the plant that produces it, and why different aspects in different plants (coffee beans vs. tea leaves, etc.)? Plants also have the survival instinct to produce a thing that keeps it appealing for reproductive purposes. In otherwords; attraction. Flowers develop nectar and fragrance to attract bees and birds for pollen distribution, tasty berries with seeds to be eaten and distributed, distinguishing colors (which would show that insects and birds see in color if there was any question), grace and beauty that seems to attract humans into cultivating them. And those are primarily decorative plants. Now let's talk about nutritious plants! Did we develop an evolutionary way to process our common edible plant choices into nutrients, or did plants figure out how to be more nutritious as a way of attracting attention for propagation purposes?